We've got a section of deviled egg recipes here, including our fool-proof method for steaming eggs so they don't shred when you peel them. But I love these pickled deviled eggs 1,000 times more than the regular kind because 1) the texture of the egg white gets chewier in the brine, 2) the yolk tastes creamier next to the pickle, and 3) Das Bigfoot crushes it. You can also mash this recipe into an egg salad and serve on toast. Oh em gee. Click here for our steamed egg recipe. While you're steaming or hard boiling the eggs, combine the rice vinegar, garlic, brown sugar, Crop Duster and peppercorns in a sauce pan with 1/2 cup water. Bring to a boil, add the onions and remove from heat. Skin the eggs and plunged into an ice bath. Place 1/2 the onions in a heat-proof container, place the eggs on top, cover with the brine and chill for 12-24 hours. Remove the eggs and save the brine. Slice the eggs in half, and smash the yolks in a bowl with mayo, 1 tbsp brine, and Das Bigfoot. Taste the filling for salt and pepper. Pipe the yolk into the egg white halves, sprinkle with Das Bigfoot and top with sliced onions. **To make Herky Perky crackers substitute 1 tbsp Herky for Cy, and 8 oz smoked cheddar for the white cheddar and parmesan . 1. In a food processor with grater attachment, shred cheese. Remove the cheese and set aside. Switch to blade attachment and process flour, cornstarch, and spice for about 30 seconds. 2. Add butter and process again for 30 seconds. The mixture will look like wet sand. 3. While processor is running, sprinkle in the water until dough forms together. 4. Transfer to counter and divide in halve. Roll into logs and wrap tightly with plastic wrap. Refrigerate 2 hours, or up to 3 days. Can be frozen. 5. Pre-heat oven to 350. Line sheet pans with silpat. Slice cheese logs 1/4 inch thick. You can roll the dough log in poppy or sesame seeds, fresh chopped herbs, or more Cy Salt or Herky Perky. 4. Bake 22-30 minutes. Cool. Scarf. 3. Add nuts and stir. 4. Spread nuts evenly over your baking pan. Bake 25 minutes. Line a lipped baking pan with foil or parchment paper, and either place bacon on a rack or direction paper/foil to bake. Bake for approximately 20 minutes until a beautiful amber brown color. Remove from oven and place on paper towels to remove any excess bacon grease. Allow to cool. In a shallow sauté pan, use approximately 2 tablespoons of the bacon grease to toast the chopped pecans until golden brown. Remove pecans to a bowl and add equal parts of Roxy Taco and Grilla Gorilla (heck - be bold and use GGX!) to taste and set aside. Now it’s almost time to assemble the bacon candy! Line a cookie sheet with parchment or wax paper. 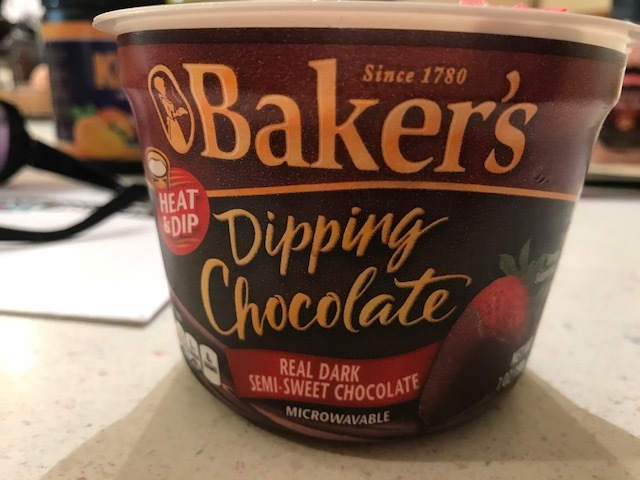 Heat the Baker’s dipping chocolate according to the directions. Do it SLOWLY so you don’t break the chocolate. 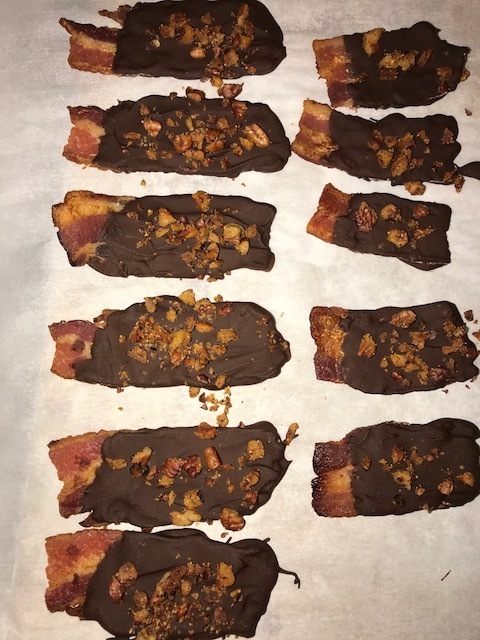 Dip each piece of bacon in the melted chocolate, leaving about a half inch uncovered where you can grab it. Use a spoon to make sure both sides are covered. Some people don’t like a lot of chocolate on theirs (weirdos) and others do - a matter of opinion. Place the coated bacon slice on the lined cookie sheet and while the chocolate is still wet, sprinkle it with the pecan mixture. Repeat until you run out. Place cookie sheet in fridge or freezer to allow chocolate to set. Remove from cookie sheet and store in covered container in refrigerator. Benedictine is a traditional crustless cream cheese cucumber sandwich served on Derby Day. They actually use green food coloring, but we used Alliyum to give this crustless white bread wonder serious pizzaz. Peel and grate the cucumber into a strainer. In the bowl, combine the cream cheese, mayonnaise, and Alliyum. Spread about 1/4" of goop onto each slice, spreading just almost to the edges of the bread. Top with lettuce. Sandwichify. Cut diagonally into four triangles. Hot browns are Kentucky staples: turkey and cheese sauce atop toast. Ada the Lexingtonite suggested topping them Roxy Taco and avocado, and I was like [ten million high fives]. Adapted from the Brown Hotel's recipe. Melt butter and slowly whisk in flour to form a thick paste or roux. Cook roux for 2 minutes over medium-low heat, stirring frequently. Whisk heavy cream and cook over medium heat until the cream begins to simmer, about 2-3 minutes. Remove sauce from heat and slowly whisk in Pecorino-Romano cheese until the sauce is smooth. Add nutmeg, salt and pepper to taste. For each Hot Brown, place one slice of toast in an oven safe dish and cover with 7 oz. turkey. Take the two halves of Roma tomato, two toast points, and 1/4 of the avocado slices and set them alongside the base of turkey and toast. Pour half of the sauce over the dish, completely covering it. Sprinkle with additional cheese. Place entire dish under a broiler until cheese begins to brown and bubble. Remove and cross two pieces of crispy bacon on top. Sprinkle with Roxy Taco and parsley and serve. I invented this for a tasting at Wheatsfield. I used Roxy Taco, but you could try Das Bigfoot, Alliyum, Smoke Licker, Grilla Gorilla or GGX, Cha-cha Lima, or Coco Corazon. The orange juice brings out the zing in the spice, but you can do without it. You can also cook it in a smoker for an hour instead of the oven if you're cray-cray like me. Preheat your oven or smoker to 250º. Melt butter over medium heat. Mix in brown sugar, corn syrup, orange juice and salt. Stir until boiling at the edges. Lower the heat slightly and let boil until the caramel is 250º. Remove from heat and add the baking soda. Stir in the bacon. Put the popcorn into a giant bowl and pour the caramel over it. Mix well. It's hard. You may feel like your arm is going to fall off. Divide the popcorn between two slightly oiled cookie sheets and cook for 45 minutes to an hour, mixing every 15 minutes. Remove from the oven and let it cool. Break the slabs into an air-tight container and refrigerate.